An orrery is a mechanical model of the solar system or parts of the solar system that can predict or illustrate the relative motions of the planets and moons. I have always found orreries fascinating, and when I found that there were no 3D printed versions of orreries yet, I was a bit shocked. 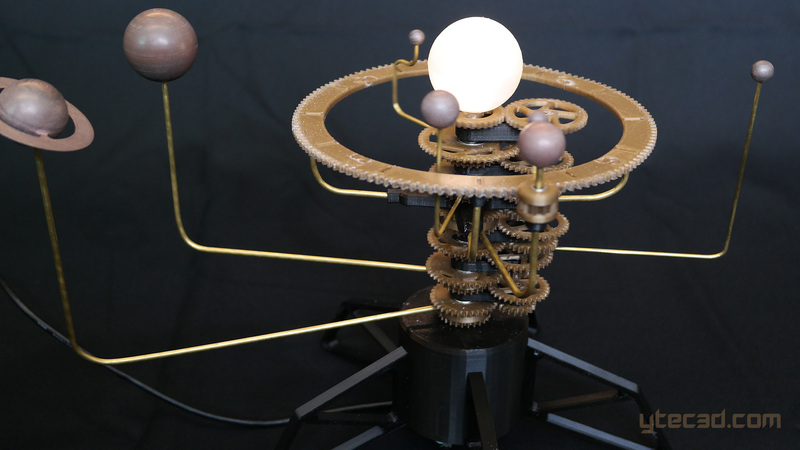 I decided that I wanted to design my own version of the orrery, completely 3D printed. 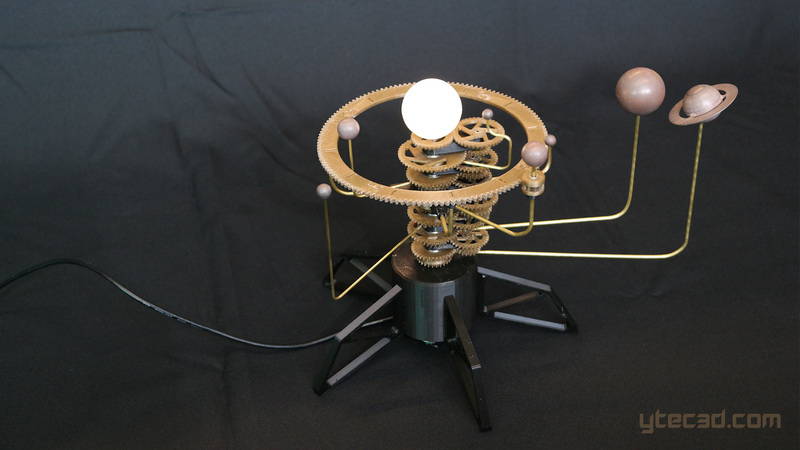 The orrery is within 0.1% accurate relative to the real solar system. The orrery that is shared here is an orrery for the planets Mercury to Saturn. The sun spins and can be made to light up. The moon is also present, spinning around the earth. 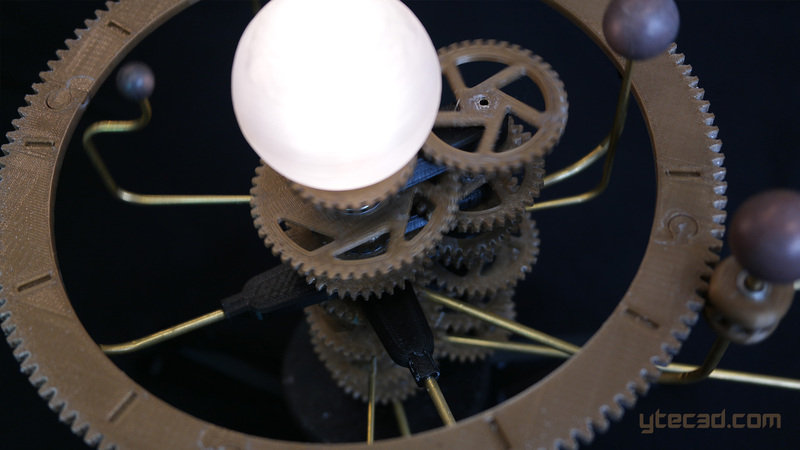 The whole orrery is made from 3D printed PLA. Gold for the gears, black for the frame, clear for the sun and Bronzefill for the planets and moon. 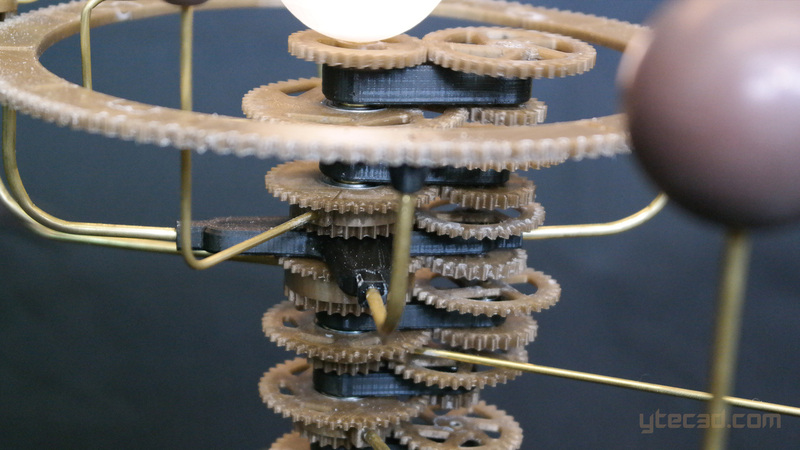 All in all the orrery was printed in around 15 hours with a layer height of 0.2mm. 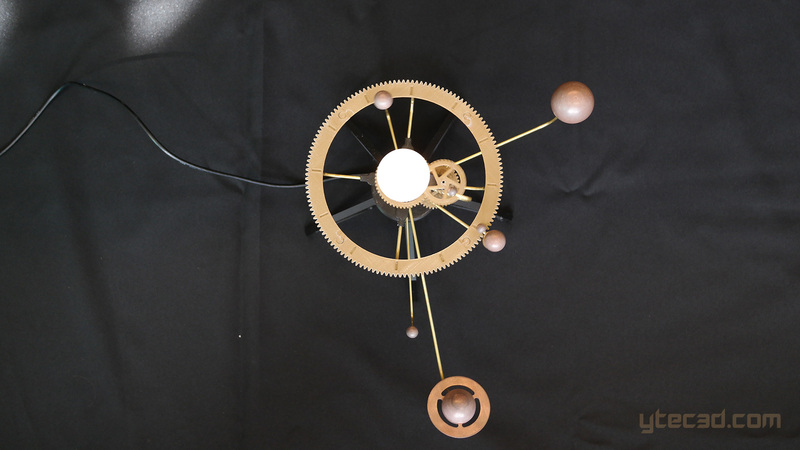 To make the orrery run smoothly, all rotating parts use ball bearings. The base houses a small 5V motor that is powered by a USB cable. The sun is lit using Led’s and a slip ring is used to get the power to the spinning sun. Uranus and Neptune have also been designed, but have not been incorporated in the main design. Both Uranus and Neptune spin really, really slowly around the sun and make the orrery incredibly large. On most old orreries they are also not included. For these reasons the 2 last planets were left out. They are still available in the downloads for anyone that does want these 2 planets. Amazing work btw. 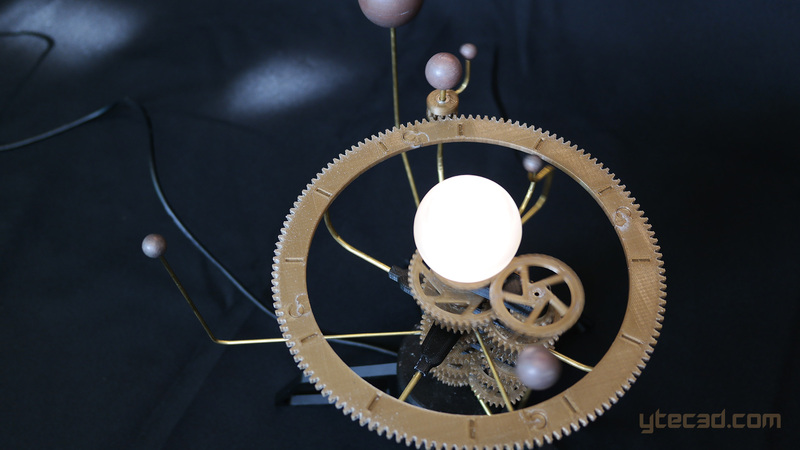 Im designing an orrery of my own, but would love to use your excel file for finding your gear ratios. Would you mind explaining how it works? I cant tell which numbers are supposed to be what in your second sheet. Thanks in advance! I purchased all the materials as per the instructions, however, I’m having a hard time fitting the 688Z bearings on the 8mm central shaft. I double checked the bearing and it appears to be the right size because I can see 688Z written on the it, and the inside diameter is ~8mm. Considering the bearings and the shaft are the same size, it makes sense that it would be a tight fit, but I feel that it shouldn’t be this difficult to slide them onto the shaft. Does this sound right to you, or should the bearings slide right on? hello congratz for the project its amazing. im trying to bring this project at my final exmas at school, but im gonna ask you, if possible, all solidworks files in order to modify a bit it, and put my sign just in some parts. it will be appreciated to have as much files as possible too.